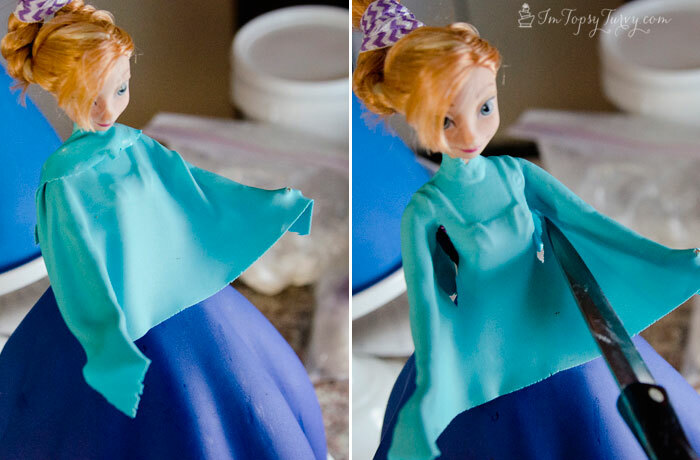 Today I’m Sharing the Anna tutorial and tomorrow we’ll do Elsa! 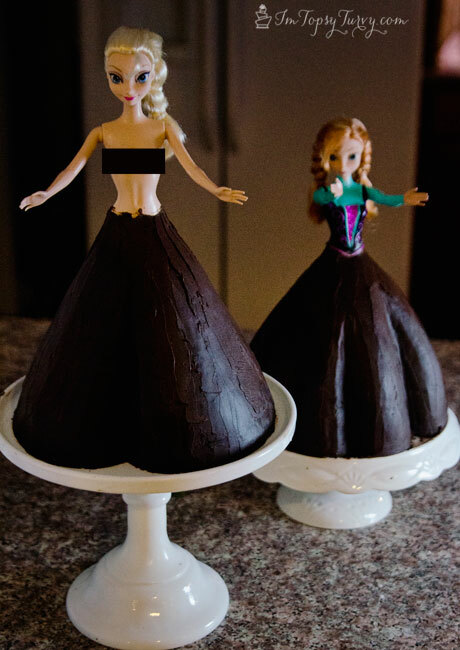 Making these cakes was so much fun! Looking back there are a few things I’d change. The week of the party the baby got sick and I got behind. So I felt kind of rushed through the cakes, I MIGHT actually break my no repeat rule to add the final details I feel were missing from these. So Anna. The first question is WHICH dress to make. I debated doing her ball dress, BUT since we weren’t doing ELSA’s ball gown I decided not to. Her hiking winter dress is actually shorter, showing her ankles and boots, but of course for this I made it full length. It’s also full than it is in the movie, to leave enough cake to actually EAT! 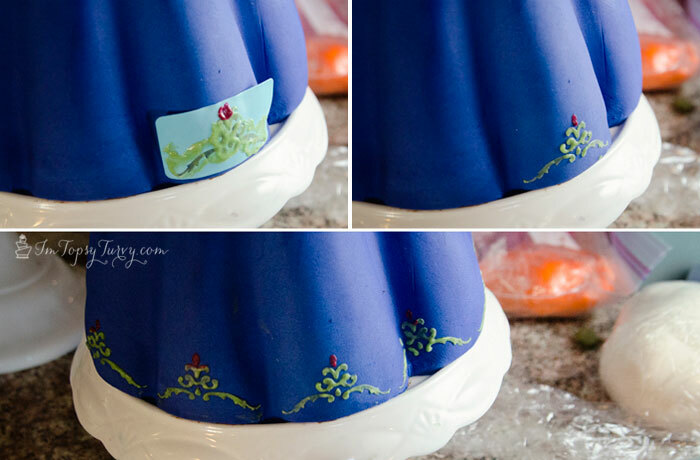 Use Ganache to stick the cake layers together. Then wrap the dolls legs in plastic. I cut a small hole into the cake first to guide the legs. Notice even with the extra height the cake still falls short of her hips, don’t worry about it, I use the ganache to fill it in. 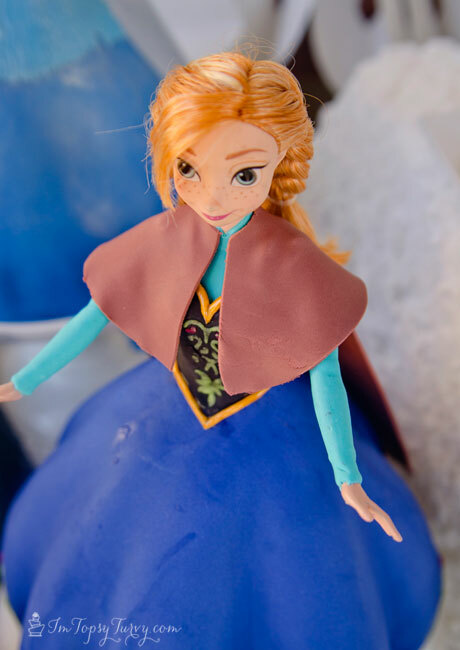 Then start carving around your skirt, I find that carving it makes it look more skirt like and less cake-ish. Start small, you can always carve away more, you can’t carve less once it’s gone. Once your happy with them carve the sharp edges to soften the curves. 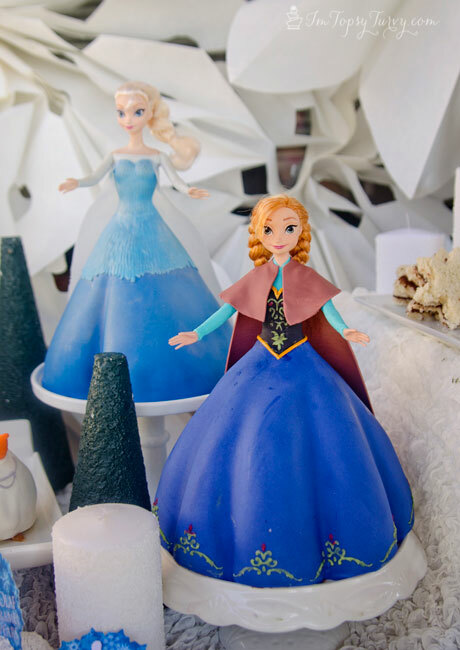 Once your done carving wipe away the crumbs and frost with ganache. Make sure to get into all the cracks and fill in the hip area. Smooth as good as you can, then let it set. Once it’s set you can rub any points and they’ll “melt” and smooth away! I love working with ganache! wrap it around the arms, shoulders, neck, etc… cut a straight light where the it meets under the arms to hid the lines. Don’t forget to cut the nice neckline as well (I forgot before the picture but did it later). for the bodice rather than try to cut it ON the doll and get it to stick I cut the neckline out first adding extra length in the straps and the sides for wrapping it. 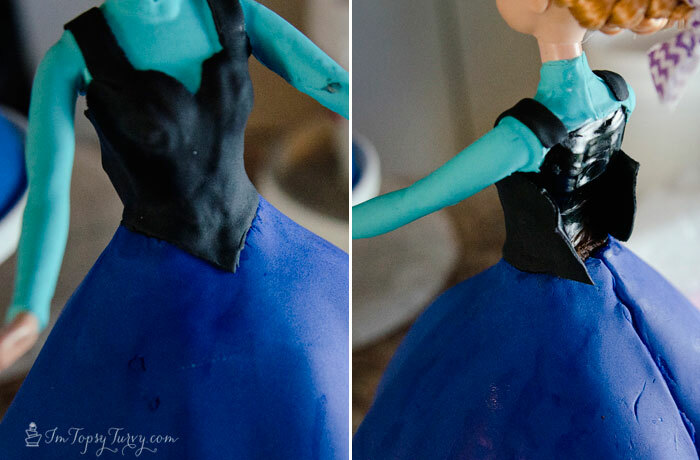 Then paint the back with the vanilla/vodka and place it on the doll. Be VERY careful when doing this, the sticky back side WILL stain your turqouise shirt if you get it out of place. press it into place in the front, cutting the waistline. 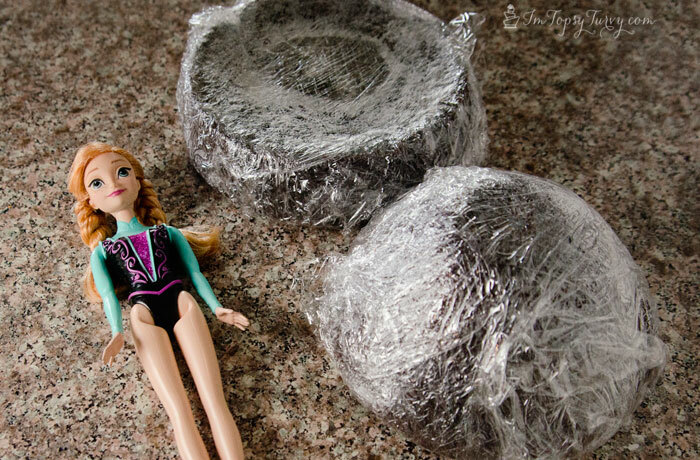 Then wrap it around the back, pressing it into the doll so you don’t get bubbles. Stretching it a bit where you need to, and cut a nice clean line down the back. Now the bare bones of the dress are done! time for the details! 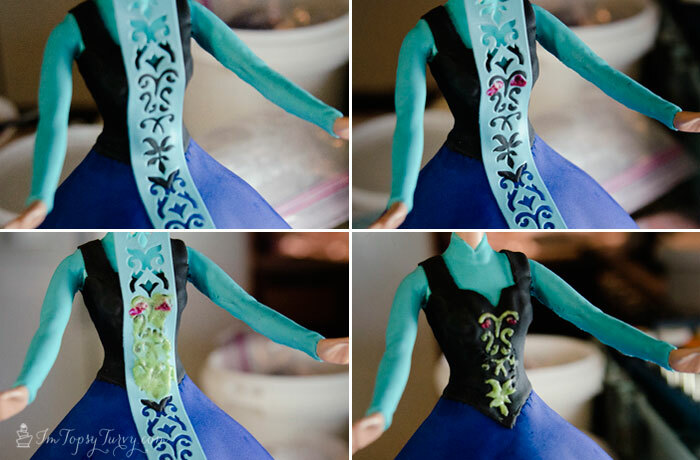 To get the details of the embroidered front of the bodice I used one of my favorite things, adhesive stencils! There are a lot of options with small details this is the one I used. Then I colored some icing green and burgundy. 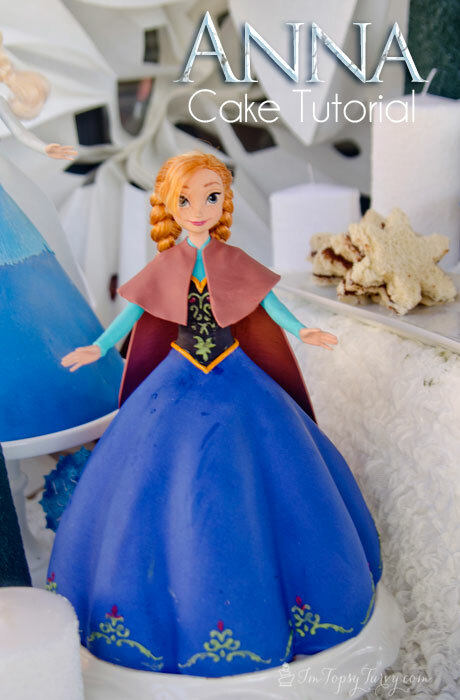 You can use buttercream if you have some, I opted to make a quick batch of royal icing. Place the stencil going down the center, add the green where you want it, not too thick, and then add a little bit of the burgundy. 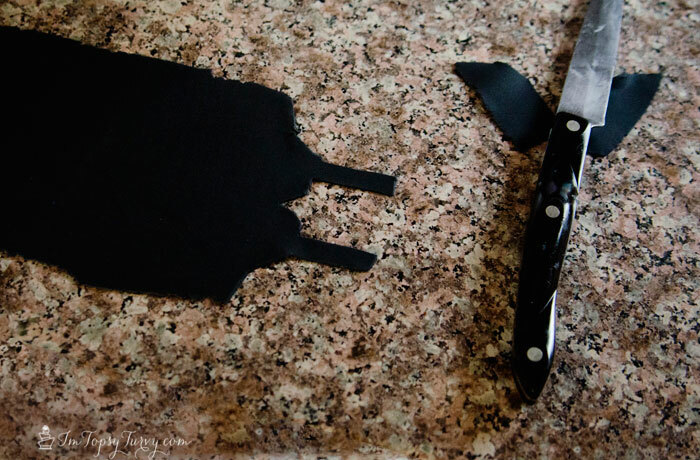 then pull off the stencil (just make sure, unlike me, you let your black fondant dry completely first or it will pull away a bit.). 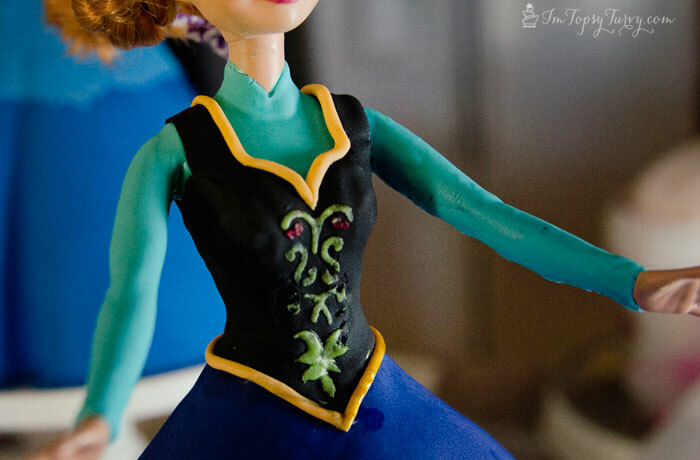 I used a clay extruder (that I ONLY use with fondant and gumpaste, NOT clay) for the edging. Soften some gold fondant by kneading some extra shortening into it, then extrude it through one of the smaller holes. Attach it to the edge of the bodice using the vanilla/vodka and then for a final step paint it with some gold airbrush paint! Now for the bottom of the skirt, again you can hand paint but I used another self adhesive stencil and the green and burgundy royal icing again. I started by doing a center one, then working my way around both sides. The great thing about the adhesive stencil is it sticks inside the nooks and crannies of the skirt better than a traditional stencil would. Finally roll out some burgundy/brown fondant. Cut along piece, rounding the edges, and let it dry a bit (flat or rounded) then attach it down the back to her shoulders. Once it’s all set roll out another small amt cut a circle with a hold in the center and wrap it around her shoulders. Then trip the neck and front. Here is the mistake I made, I cut the fronts square, I SHOULD have cut them rounded! GAH! and I wish I’d had the time to paint the edges a darker shade. Oh well, overall I LOVE how Anna turned out! I think they look GREAT together too! AND the birthday girl love love LOVED them so nothing else really matters! 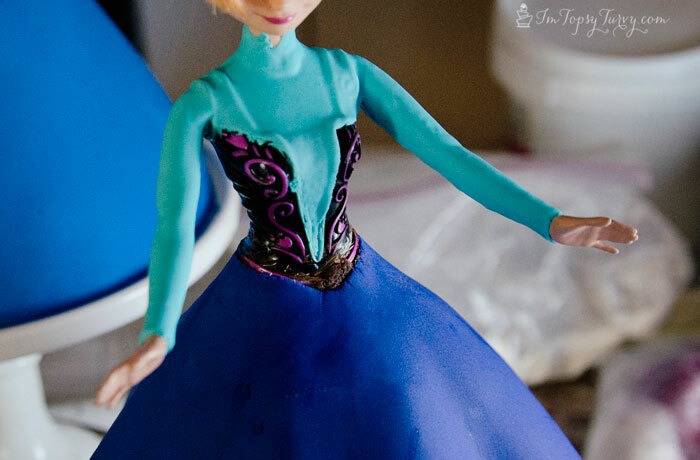 Hello… I love your Frozen Princess cake..I have a request to make one for a dear friend’s four year old little girl. It will be my gift to her. Where can I buy the stencils to make the pattern, and do you sell them? Hi there! 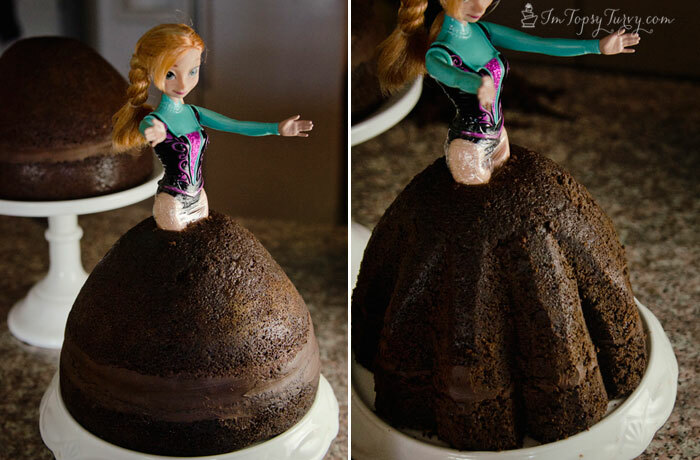 Love the cake and the tutorial. If I were to use butter cream and stack 7in cakes and shape the skirt how much butter cream would be needed? 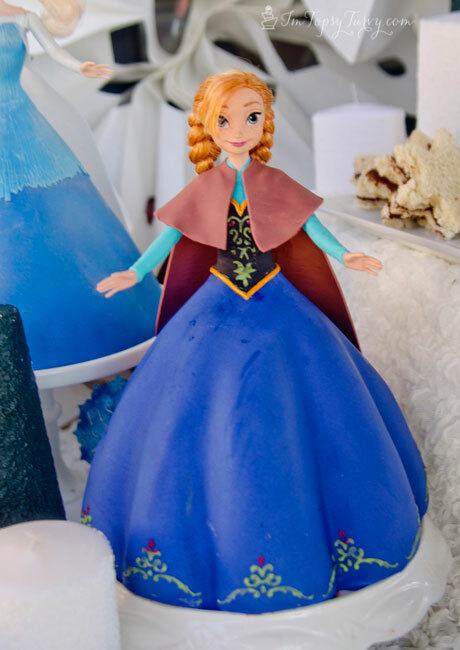 I’m making both anna and elsa for my daughters birthday and am trying to gage on how much butter cream will be needed. Thank you! 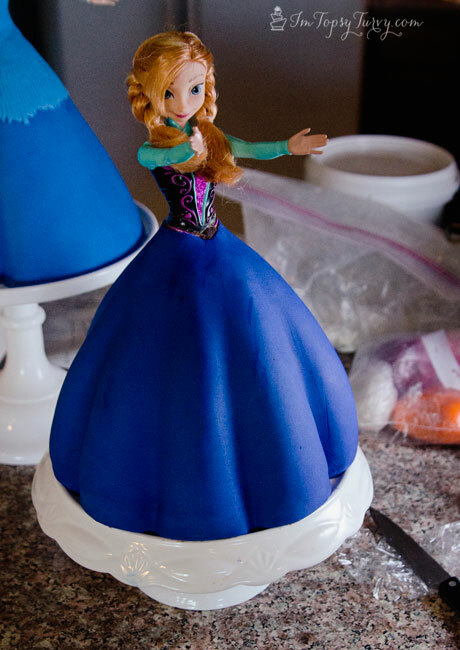 I wouldn’t use buttercream, I NEVER do under fondant or with cake carving. I ONLY use ganache, that said I probably used about 2 C cream and 6 C chocolate for both cakes.